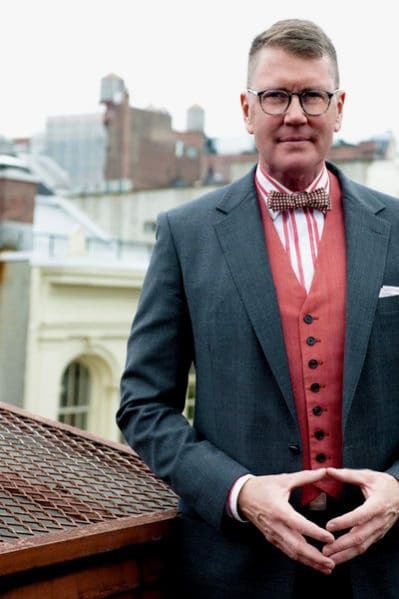 Thomas Jayne – Today’s featured designer focuses on Thomas Jayne, who not only is a world renowned interior designer but is also a friend, scholar and antiques aficionado. Jayne’s interiors are known and celebrated for his use of classic and traditional decor that he pairs with the hot trends of recent times. Jayne’s background in antiques, American architecture, and decorative arts shine brightly in the interiors he so masterfully creates. Over the past twenty years, Jayne Interiors has been creating remarkable and breathtaking spaces full of rich tradition, history and beautiful modernity. Jayne’s designs have been praised for their keen attention to detail and use of historically opulent pieces to create spaces of prime American design. His ability to interweave ancient and modern designs into cohesive works of art is absolutely uncanny. With Jayne’s expertise in Victorian styling and modern designs, he is a force to be reckoned with in today’s design world. Jayne has had his works published in the New York Times, Town and Country, Vogue, House Beautiful, and Home and Garden to name but a few. Jayne is a true visionary and icon in the world of interior design. Very few interior designers will ever have the depth of historical knowledge that someone like Jayne would have. 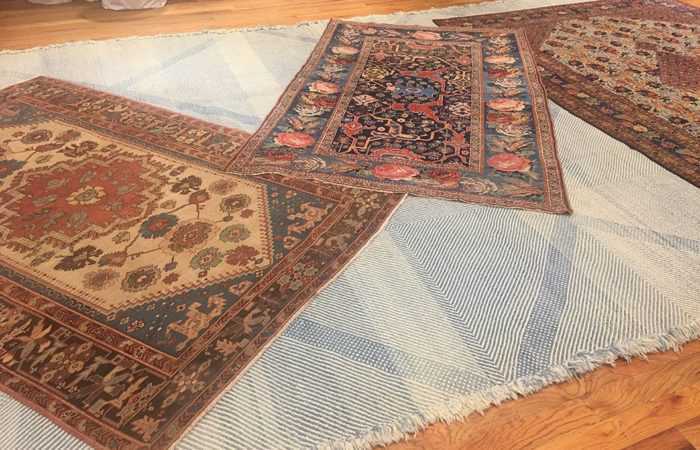 In addition to his deep appreciation for all (great) things old, he is also one of most knowledgeable designers when it comes to antique rugs specifically. This is why, most of his projects will incorporate art and museum level antique carpets Not only does he know what looks good – Thomas Jayne also knows what IS good and that is apparent in his work! 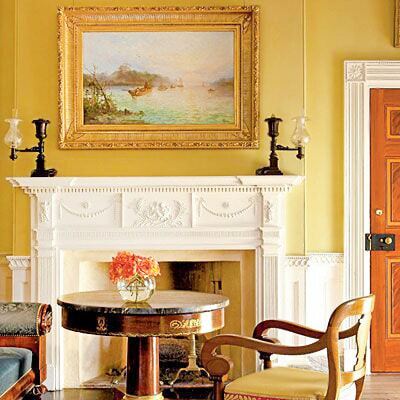 Recently decorated by Thomas Jayne, this Park Ave Apartment is a dreamy and elegant abode. New York Park Ave Apartment by Jayne Design Studios – This is the city beautiful in it’s diversity, breath-taking in its appreciation for art, and home to many. 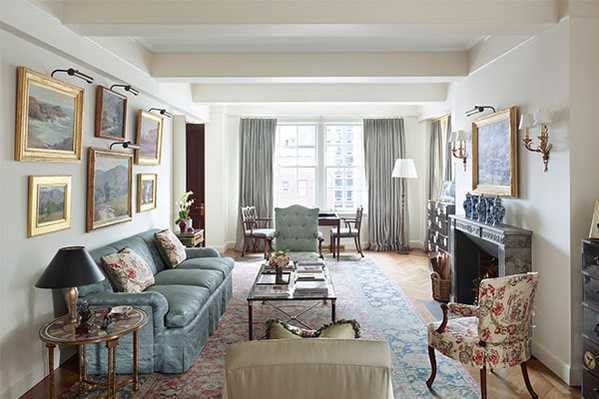 Thomas Jayne’s most recent interior design project in Park Ave, New York, reflects the sophisticated aura of New York, and the celebration of mixing cultures. Among rescued French portraits and Japanese chests, a beautiful antique Isfahan carpet rests in the living room. 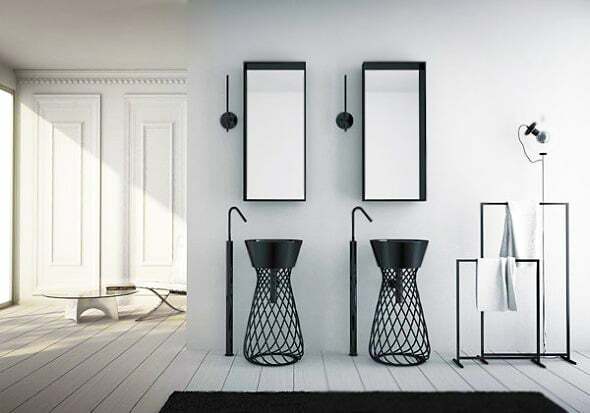 Thomas Jayne is one of Nazmiyal’s favorite designers, his use of textures, colors, and thoughtful approach to design carefully brings out the characters and personality of a room. Here a marble table with a colorful natural palette rests on the Isfahan Carpet by Nazmiyal Antique Rugs. 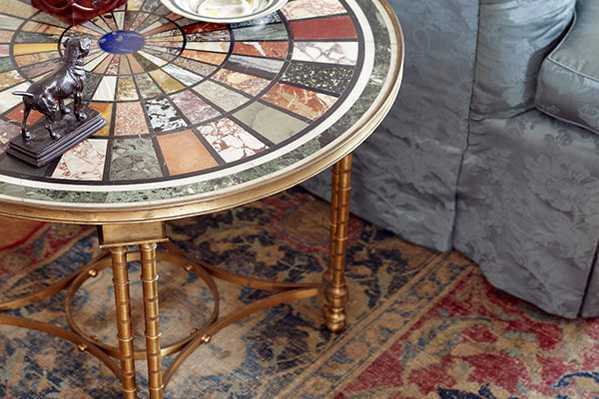 The natural marble is highlighted by the red and blue hues in the antique Oriental carpet. 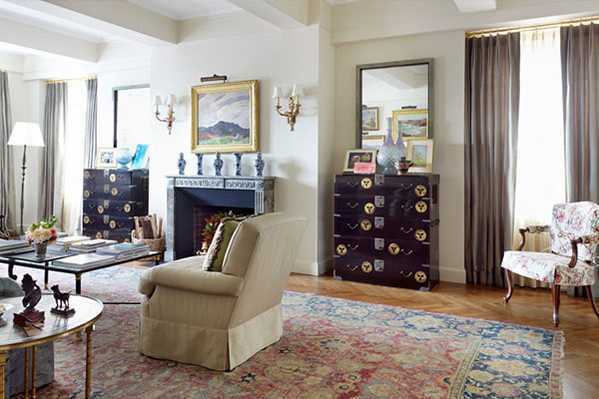 Jayne Design Studios decorates a beautiful apartment with Isfahan rugs and collectibles. The living room has a traditional classical approach with soft couches and floral patterns throughout the scene. The fire place mantel is carefully decorated with Chinese Garniture, and the client’s eclectic collections on display on top of the dark Japanese chests. The beautiful living room with its antique area rug features vintage touches, intricate borders, and beautiful furniture. 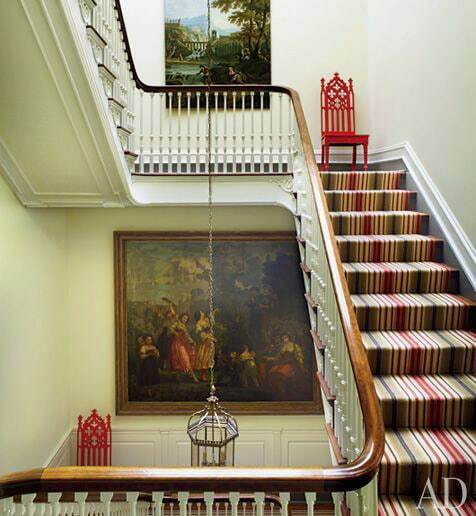 Jayne Design Studios with an Isfahan 17th Century Antique Rug. To really hold a room together, large oversized rugs work the best. This beautiful antique Esfahan adds sophisticated character and an elegant history to the Park Ave home with its arabesque designs and decorative contours. 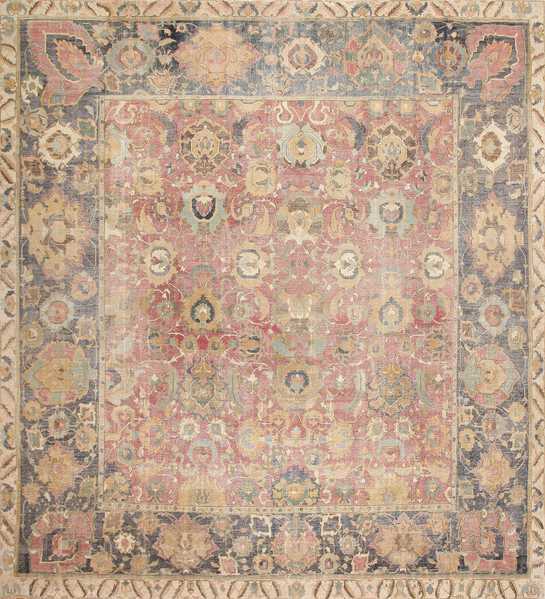 See this antique 17th century carpet on our site. Antique Isfahan Rug from the 17th century. 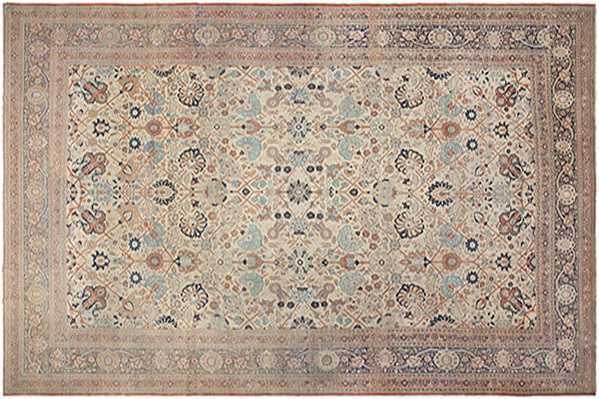 Early Period Rugs like the 17th Century Antique are rare, but important to the history and design of antique rugs. 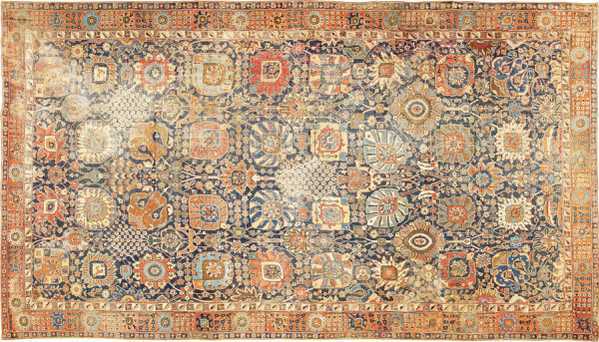 Magnificently decorated, the styles and patterns are rare to find as each rug puts in years of dedication and craftsmanship. Because of their extraordinary designs and quality, these rugs are highly distinguished luxury investment worthy pieces. Try this Large Antique 17th Century Square Rug. Mesmerizing dark borders floral patterns. A Valuable Persian vase Kerman from the 17th Century by Nazmiyal Antique Rugs. See this rug here. Antique Persian Haji Jalili Tabriz Rug renowned for high quality fine pieces. 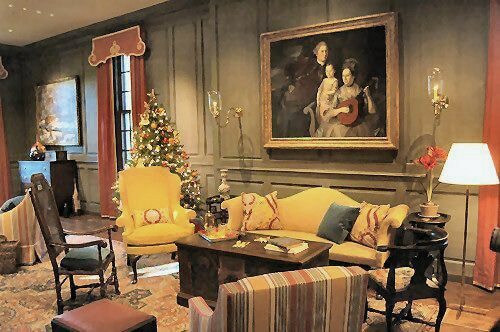 This week’s interior design blog spotlight blog post about Thomas Jayne Interior Design Studio was published by Nazmiyal Antique Rugs which is located in the heart of Midtown Manhattan, New York City.